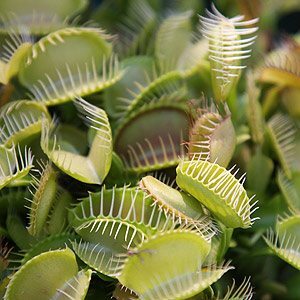 The single species genus Dionaea is famous for its single member, the Venus Fly Trap which is Dionaea muscipula. This is the easy care and most popular of all of the carnivorous plants and incredibly popular with kids around the world. The plant is originally from North Carolina and it comes from somewhat swampy areas, it the wild it lives on nutrients from the soil and air as do most plants, however it supplements this with a the ability to trap extra food in the form of insects. The teeth like jaws are triggered to shut when an insect touches the fine hairs inside, and that is the end of the insect. Now each plant has a number of ‘traps’ and they will come and go, so sometimes they just turn a blocky brown and drop of, but new ones will grow. Being so easy to grow is the key to the popularity of the Venus Fly Trap. A damp root zone, lots of sun and of course as it comes from swampy areas, humidity. Many home growers use glass containers such as fish tanks where they can mimic the natural habitat. This is fine in cooler areas, however in warm climates the combination of glass and sun can make things a little to hot, so be careful. You can also grow them outdoors in a container, in the cooler months partly cover with glass to keep them warm. Many growers use sphagnum moss as a growing medium and this works fine, you will find it at Bunnings and Masters stores. As for water, use rainwater if you can, or at least let the tap water sit for a day or two so the chlorine dissipates. As for feeding, they generally find their own insects however you can feed them, small insects, they do not like big ones that much. They can turn black maybe indigestion, so small insects please. And no mince meat, thats another good way to kill them. Propagation is by division of the clump of roots or from seed. The plant dies back. This is natural, in winter the plants will die back for 3 – 4 months, and this is natural, it will spring back to life (in spring of course). Cut back the water a little during dormancy. The plant arrives in a plastic container like a cloche, what do I do. They are sold this way because they are easier to get growing, however this is not a long term home, they need to be hardened off. Although only one species is registered the Venus Fly Trap is a variable species so along with hybridising a few different forms are available, care is the same for all.